In all areas of life we find hidden treasures and charms. Beautiful and surprising things emerge from the most unlikely of places, given enough time or some encouragement. No, we are not speaking about 90's coming-of-age movies, but the same principle applies. If the renovation of an old and uninspiring apartment is undertaken by a talented professional, the transformation may also be accompanied by the realisation of inherent qualities that had been neglected in the previous state of affairs. It is thus not only about making changes, but also unearthing the unseen virtues that had already been there. 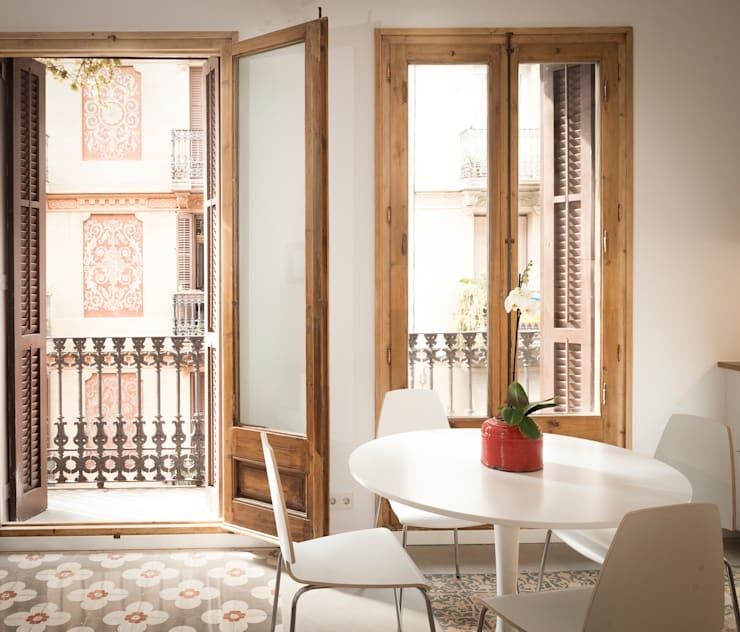 Today on homify we will take a look at one such project in Barcelona, Spain. The protagonist in question is an old little apartment close to the ocean, and the talented professionals in this case are from Oak 2000, based in the same city. Whilst the owners of the home thought that they were in for a simple renewal, the firm soon realised that the quaint little apartment had many hidden treasures that only needed the right treatment to see the light. Curious? Well, join us to see what they achieved! 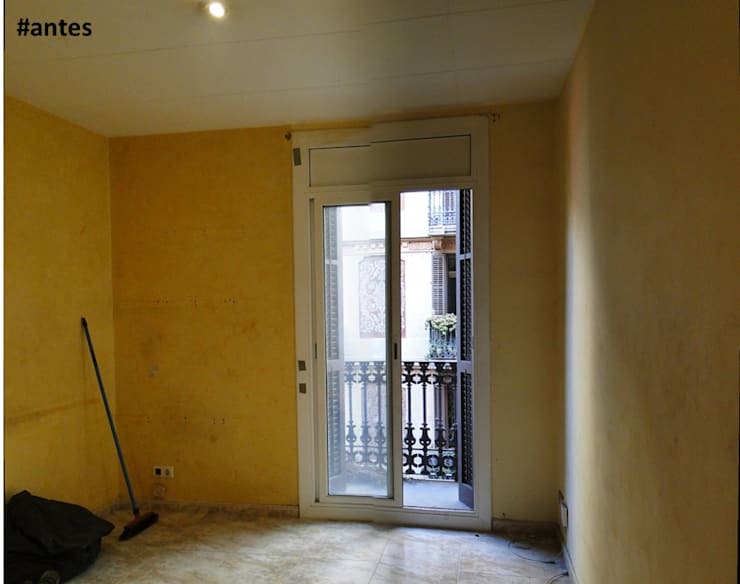 Here we have a view of our apartment before the renovation, and from the picture, in fact, it seems to be in preparation of said renovation. As we can see here, the apartment is divided into several rooms and closed-off sections, since this had been the predominant architectural style of European apartments several years ago. This is, of course, not conducive to modern style where open plans receive prominence, and the compartmentalised nature of this home does not lend itself to spacious rooms and optimal use of available area. The materials used in the apartment before the renovation are also now long outdated and very worn at this stage. The yellow paint on the walls seem dull and faded, whilst the beige vinyl floor seems in dire need of a renewal. The wooden door frames and panels on the wall also look anachronistic. It is safe to say that there is nothing in this image that would find its way into a contemporary home. The type of before-and-after projects we review here on homify are bound to make you wonder whether you are looking at the same house in the 'after' pictures than the one you had seen in the 'before' images. This one is no different. 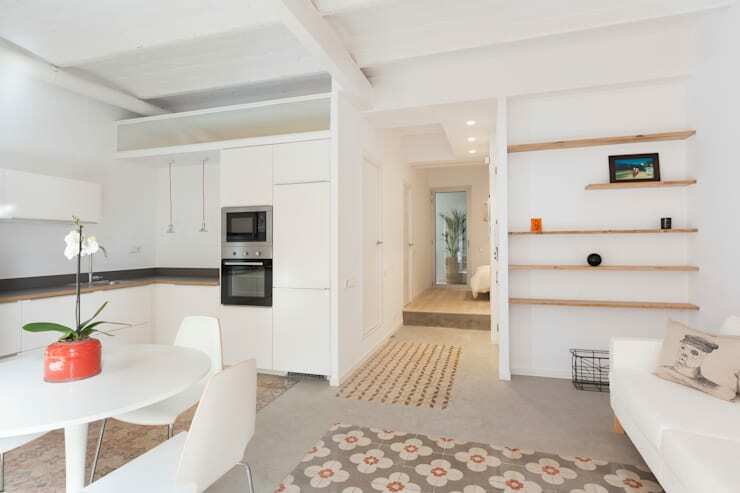 Can you believe that this bright and spacious apartment even takes up the same space than the one we saw before? It is certainly an impressive renovation, to say the least. We can see that the designers opted for white surroundings, which will make any space feel like it has increased dimensions. This goes hand-in-hand with the decompartmentalisation of the apartment, taking down unnecessary walls in order to reveal a large and open living space. The hallway had also been shortened, ensuring a better flow of light and air throughout the entire home. Now let us move into one of the dark rooms we could discern from our hallway vantage point in the very first image. Here we find a small room that is privy to a glass window leading onto a compact balcony. We get a glimpse of the exterior architecture here, and we can see that the building must be quite old, going on the ornamental masonry of the balcony banister. The room's interior is in the same style and finished in the same materials than the hallway. For the same reasons mentioned with the first image, this is a completely outdated look which fails to inspire any aesthetic enthusiasm. The room also feels very dark, despite the large door which should be bringing in plenty of natural light. 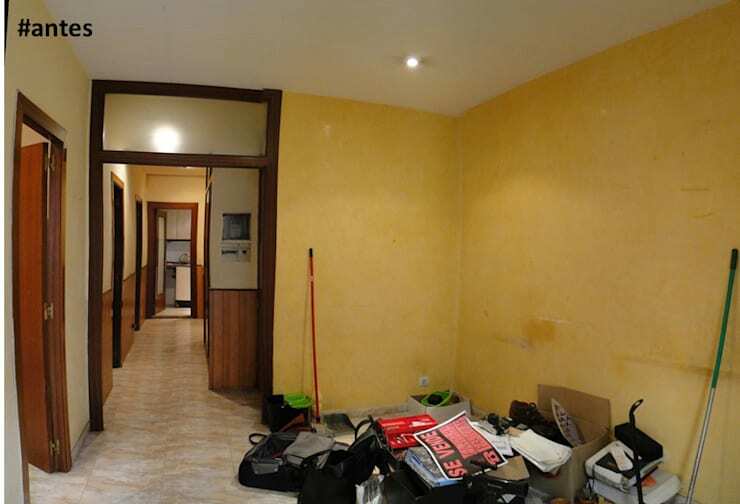 During the renovation of the apartment, the wall we saw on the right side of the previous picture had been torn down. The result is an open-plan living area which is much more accessible, both in the literal and figurative sense. The removal of the division reveals another set of glass doors opening up onto the beautiful, ornamental balcony, and the pair have a much greater effect than the single one had in its own little room. You can see for yourself that the space looks lighter and brighter than the ominous room in the previous picture. The designers also replaced the inappropriate and cold aluminium door frames with wooden ones, and this element brings a warm and natural touch to the home. It is also a great transition from the antique balcony to the modern interior. Zooming out from the glass doors to take a look at the larger living area, we can also see the composition in its entirety. This newly opened space includes the kitchen, a small dining area, and a living room space. With the glass doors situated in the middle of the room, all of these living spaces have equal access to the balcony, as well as the natural light it allows inside. 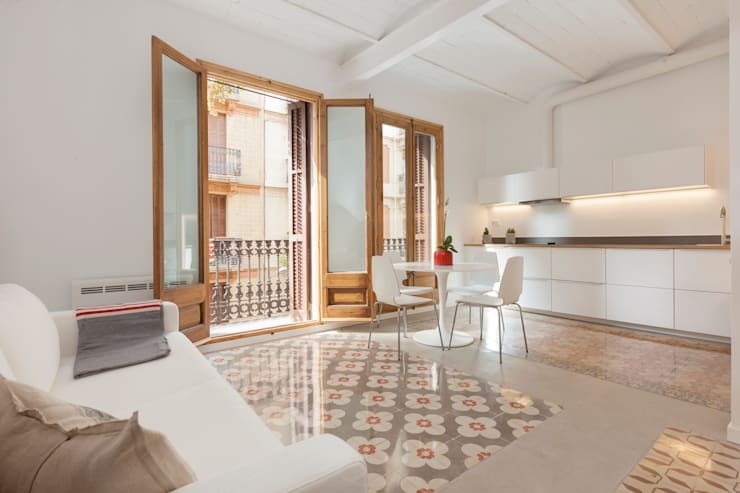 The flooring of this apartment yields an interesting design: It consists mainly of concrete, with patches of hydraulically pressed tiles at each different area. The living room space has its own square of tiles, and so does the kitchen, but each set of tiles have a different pattern. This innovative design allows for the creation of visual interest and decoration in an otherwise neutral and clear space, but also divides the open-plan living area into its respective spaces (kitchen, living room, hallway). 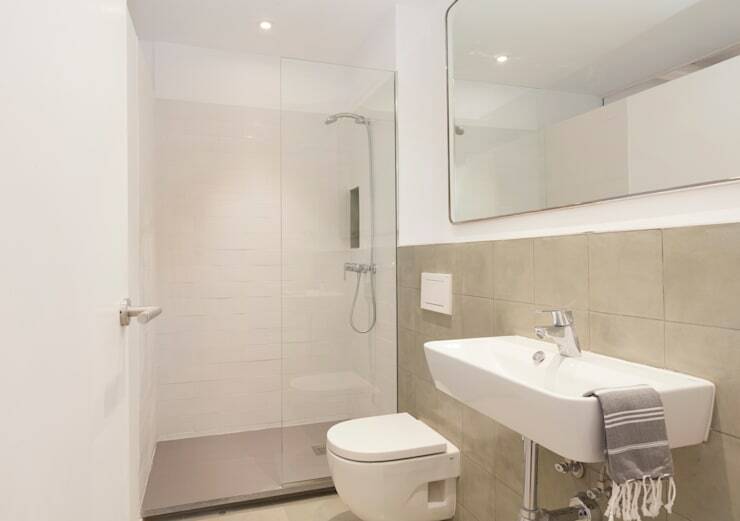 Lastly, we make a quick stop in the bathroom, just to see if it upholds the style ethos of the rest of the home. We are quite sure to say that it does indeed. The style is primarily minimal, which is a great asset in small living space, not to mention very trendy at the moment. It is also timeless—good quality design will remain the bedrock of homes which will be altered according to more fleeting trends in the future. For a similar project where an old European apartment is opened up to the modern age, take a look at this: Inspiring apartment upgrade. What did you think about the new apartment's unusual floor design?